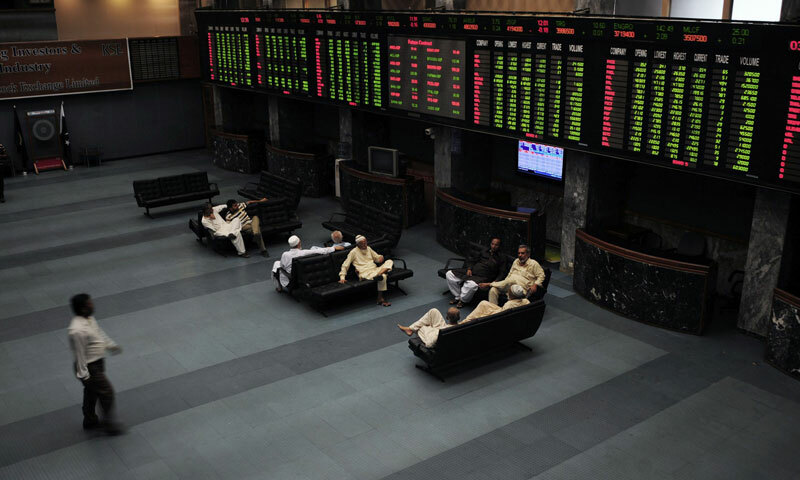 KARACHI: Stocks fell for the second day on Tuesday with the KSE-100 index down 76.55 points to 22,276.65. The market remained dull with only 80 million shares coming up for trading, the volume drying down to nearly half of the Monday�s turnover at 159 million shares. Trading value declined 18 per cent to Rs3.003 billion, from Rs3.642bn. A bevy of corporate results were announced on Tuesday with most of the liquid companies coming up with improved earnings. Nishat Mills; Bank of Punjab; Pakistan Petroleum all showed up healthy bottom line, yet they failed to boost sentiments. Analysts said that the market was perhaps waiting for the CPI announcement, which was crucial in determining the trend of the next SBP monetary policy statement. With the results season about to come to an end and almost all liquid companies having already released their quarterly financial statements, the only saving grace for the market at the time appears to be the continuous inflow of foreign portfolio investment. On Tuesday foreign investors bought $3.79 million worth stocks. The local participants, both institutional and individuals, were net sellers. Companies, mutual funds and individuals offloaded stocks of the value of $0.23 million; $1.24 million and $3.17 million, respectively. However, banks bought stocks worth $0.85 million while �other organisations� stayed on the sidelines. Analysts said that going forward the equity market looks lacklustre in the short term with limited participation expected from the local institutional and individual investors as result season is also coming to an end. The market capitalisation based KSE-30 index was down 48.82 points to 16,916.94 and market capitalisation eroded by Rs13bn on Tuesday to Rs5.310 trillion. Of the total 317 stocks traded on Tuesday, losers at 191 were ahead of the gainers at 104. The highest increase on Tuesday was noted in Unilever Foods, up by Rs250 to Rs5,250, followed by Colgate Palmolive higher by Rs65.55 to Rs1,377. The biggest fall was seen in Rafhan Maize down by Rs50 to Rs5,000 and Bata (Pak) lower by Rs38.85 to Rs1,780. Dealers on the sales desk at Sherman Securities stated that major liquid companies like NML, Engro, BoP and PPL announced better results, however, with result season almost ending and concerns rising over hike in interest rates, market showed weakness in general. Some of the major stocks though closed in green, including PPL, BoP, NML closed up on better results announcements. FFC, FCCL, MLCF were a few other stocks to go up. On the 10-top traded list, KASB Bank, a second tier stock, led the pack with 10m shares up 34 paisa to Rs2.03. It was followed by Jah.Sidd.Co down 25 paisa to Rs8.19 on 5m shares; Bank of Punjab also on 5m shares rose 18 paisa to Rs10.24; Engro Corporation plunged by Rs2.23 to Rs129.08 on 4m shares, on investors� anxiety over the gas supply situation. PTCL fell 45 paisa to Rs26.46 on 4m shares; Lotte Chemical was down 17 paisa to Rs7 on 3m shares; Wateen Telecom Ltd remained unchanged at Rs4.50 on 2m shares; JS Investments shed 10 paisa to Rs10.27 on 2m shares; National Bank of Pakistan was down 14 paisa to Rs47.73 on 2m shares and Maple Leaf Cement gained 37 paisa to Rs21.39 on 2m shares. On the heavy-weight oil & gas sector, Mari Petroleum surged by Rs7.61 to Rs159.91 and Attock Refinery gained Rs2.09 to Rs181.87., while other stocks closed in the red. OGDC, that supports the index, was down 38 paisa to Rs257.86; Pakistan Oilfields lost Rs5.78 and PSO the major gainer on Monday, conceded Rs5.72.